Now, for the first time ever Rankin Audio is proud to offer a complete collection of the Massive presets that have inspired and aided many thousands of tracks worldwide. 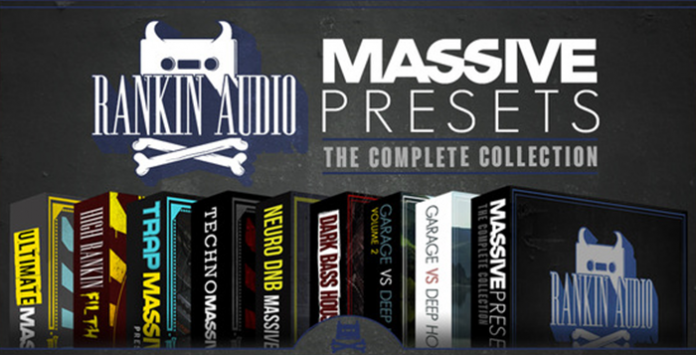 Over 750 Massive presets spanning House, Dubstep, Trap and Drum & Bass. This is an incredible collection that would serve both beginners and professionals alike and with over 40% discount on offer, this is a deal not to be missed. Focussing predominately on bass patches, the pack offers only the very finest sounds that Native Instruments’ super-synth has to offer. A collection that covers everything you will need to make the low end of your tracks dirty, heavy and seriously fat. Contained in the pack is a collection of everything you need to master the synth elements of the genre and style out a Trap monster of your very own. All the pitch- bent, bubbly goodness you can eat, harnessing the power of the one and only Massive. Just run some earth moving 808s underneath and you’re in business. Pow, bang, crash, wollop and boom. That’s right, you heard! Big man on campus Temper D is up in the building with a pack of no less that 150 NI Massive presets. Covering a full range of sounds from lush pads to full on leads, evil bass and deadly subs. Fully utilizing the power of the synth the is more responsible for changing the face of recent dance music than any other. High Rankin’s Filth Factory is the first in a series of one shots and Massive presets catering for the more unhinged of producers. A collection not for the faint hearted. Bass, leads and stabs to turn any production into an absolute monster.